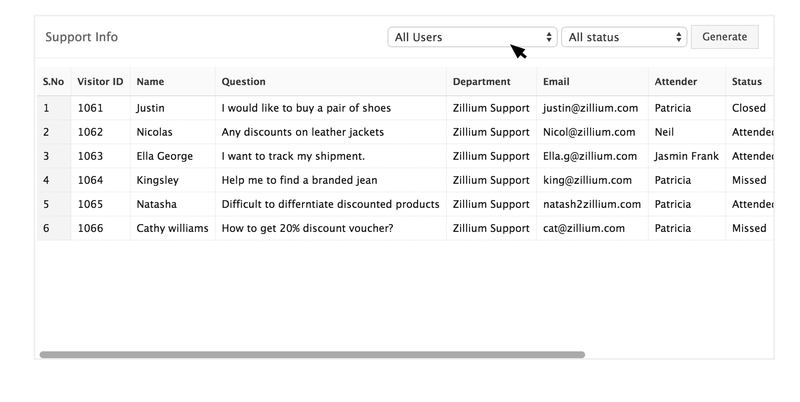 You are not limited to the Overview section of reports, you can also learn more about your customers and how they interact with your live customer support structure from the Visitors section inside the Reports module. Here you have access to another in-depth, pre-loaded dashboard of enlightening reports. From the top of this dashboard, you can configure the input for the following reports, with the ability to run a report by a specific department (or across all departments) and the time period you want to gather the reports’ data from (Today, Yesterday, This week, Last week, This month, Last Month, or Choose your own range). The first report in the Visitors section, is the Visitor Details report. This report is really three reports in one, as you have the option to run this report and visualize your total visitor interactions by day, by hour or by embed. To switch the version of the report you view, click the option you want to view (Day, Hours, Embed) at the top left just above the report. Let’s first look at the Visitor detail report viewed by Day. This particular report will display the total amount of customers your live customer support team interacted with for a given day and also break these customers into their status (Attended Online—Green, Closed—Yellow, or Attended by E-mail—Red). Hover over a particular bar graph, to see the amount of visitors for each section handled for a specific day during your defined time period. Click Hours to view the report broken down into visitor activity by hour of the day. Here the total results for each hour is cumulative for the whole time period you are currently running the report for. Through this view it is easy to see which hours of the day are your live support operation interacts with the most visitors, and also see which hours your agents attended more visitors online (or closed the most tickets, or attended visitors by e-mail). Clicking Embed, displays the Visitors Detail report with the total customer interactions broken down by which embed they entered your Zoho SalesIQ through. This is a quick and easy way to see which of your embeds are the most effective at reaching out to your customers over a particular period of time. If your embeds represent different products you are supporting, you can discover which customer segments are seeking more customer support through your live chat operation. Below the Visitor Detail report, you will find the Visitor Waiting Time report. This report also has three separate views (Day, Hours and Embed), which you choose by clicking the view you want from the top left, just above the report’s box. Let’s first explore the report by Day, where we can see the average time your customers who initiated a live chat waited for an agent to answer their request. By clicking Hours, we can see for the selected time period, how long a customer waited to have their live chat request answered depending on what hour of the day he attempted to connect with your Zoho SalesIQ. Hours that your Zoho SalesIQ is offline will not show a waiting time, as customers do not have the ability to initiate a live chat. When you click Embed, you view your customers’ average wait time for each embed. The next report you can view in the Visitors section, is the Visitor Waiting Time ratio, where you can see what percentage of your visitors (and how many visitors that is) wait before an user answers their chat request. The waiting time segments display your visitors into specific ranges (less than 5 seconds, 5 to 10 seconds, 10 to 15 seconds, 15 to 30 seconds, 30 to 45 seconds, 45 to 60 seconds) which you can hover over to see a quick picture of what segments are most common. The last report you can run in the Visitors section, is the Support Info report. To run this report, you must first select if you want to run the report for all your agent’s or for a particular agent—and choose from the drop-down menu. Then you must choose which status (Closed, Attended Online, Attended E-mail, or Missed) you want to view the report for, or you can select All Status to see the report across all statuses. When you have configured which data you want to pull the report from, click Generate to run the report. 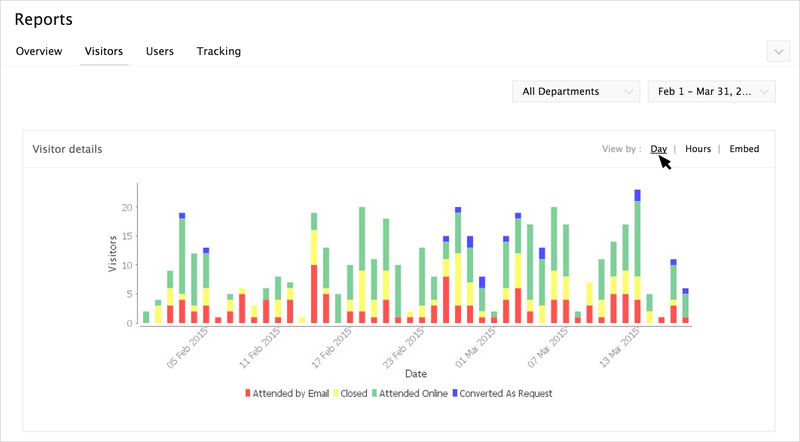 The report when generated, will display a table with each visitor’s name, e-mail address, their request status, which agent attended them, the date they created the request, the time they connected with your Zoho SalesIQ, their IP address, and the department they connected with. If the selected configuration for your report generates more than 10 visitors, you can scroll down within the report window to view the other results.